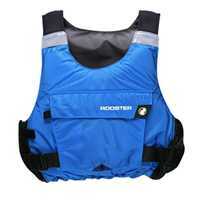 The Side Zip Buoyancy aid from Rooster Sailing. This product has been designed for maximum comfort allowing good body movement and ease of entry via the side zip. Strong Rip Stop fabric has been used for durability with safety reflective strips in key positions. For practicality it features a large gusseted front pocket with space for hat, safety knife, tape and snacks. It also incorporates a hook for keys and mesh pocket for shackles and other spares. Available in Red, Signal Blue, White, Navy Blue, Graphite and Pink.